OK, maybe not quite yet… but Pandia Search Engine News is reporting that Google runs more than 1 million servers. Pandia cites a Gartner analyst from the fair elven lands of Norway (the article is in Norwegian, so we’ll have to take their word for it). Google reports that it spends some 200 to 250 million US dollars a year on IT equipment. We know that Google make use of a large number of cheap off the shelf servers using open source (and free) LINUX. If we say that Google spends 900 USD on each machine, and the same sum on storage and peripherals, it is a fair guess that Google uses some 1 million servers in its data centers. Pandia goes on to speculate that Google likely installs 100,000 new servers per quarter in datacenters around the world. That would place Google as the 4th largest server producer in the world after HP, Dell and IBM. But does Google really have 1 million servers? I’m not so sure. The logic above is fuzzy at best and others have estimated they only have 450,000 systems. My guess is reality falls somewhere in between these impressive numbers. 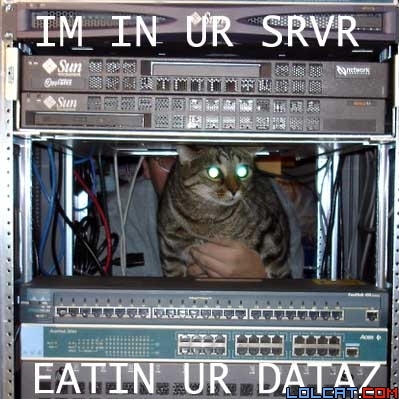 I wonder how many servers are purely dedicated to facilitating searches for LOLcats? We know that Google primarily uses white box linux-based server models and blade servers, but should they ever need memory or CPU upgrades, Vibrant sells a wide range of Used Servers. Our sales reps hear “1 million servers” and can’t help but drool.